The Los Angeles Dodgers' 2007 season started off promisingly with the Dodgers holding the Western Division lead for most of the first half of the season. However, the team faded down the stretch and finished the season in fourth place. Two of the teams big free agent signings, pitchers Jason Schmidt and Randy Wolf were injured and missed most of the season. A promising development was the play of several rookies including James Loney and Matt Kemp and the further development of second year catcher Russell Martin, who was named to his first All-Star Game. The Dodgers began their 2007 season on the road as they went to Milwaukee to begin a three-game series with the Brewers. But the Brewers pitching shut down the Dodgers offense for the first two games of the series. They got their own pitching settled down as they enjoyed a four-game winning streak, including a three-game sweep of the Giants in San Francisco. The Dodgers went to Dodger Stadium for the first time of the season and had a successful 4-2 homestand. A two-game mini-series sweep in Arizona against the Diamondbacks followed by a split of a two-game series against the Rockies saw the Dodgers go 3-1 on the road-trip. Back in Los Angeles, the Dodgers won the first two games of a three-game series with the Pirates, improving their record to a league-leading 13-5 in the process before a four-game losing streak, including being swept by the Giants, dropped their record to 13-9. They ended their April with a 15-11 record, leading the NL West. May began with the Dodgers concluding their three-game series with the Diamondbacks with a pair of 2-1 victories. After splitting the first two games of a three-game series with the Braves, the Dodgers blew a late lead in the third game of the series due to poor relief pitching. The Braves won the game 6-4 and took the series two games to one. The Dodgers continued their roadtrip with the Marlins, splitting the four game series. The Dodgers then began a 6-game homestand against the Reds and the Cardinals. They went on to have a 5-1 homestand, sweeping Reds and taking 2 out of 3 from the Cardinals. The Dodgers were then swept in a 3-game weekend series with the Angels played in Anaheim. The Dodgers returned home to face the Brewers whom they beat two in a row after dropping the first game of the series. The Dodgers then took two of the three games they played with the Cubs at Dodger Stadium. In Washington, they took two out of three games, shutting out the Nationals in the first two games. The Dodgers beat the Pirates in the first game of a four-game series in Pittsburgh, the Pirates held the Dodgers to just one run in a 3-1 victory. The next day the Dodgers came from a 4-0 deficit to win 5-4. The Dodgers then went to San Diego to play the Padres and were swept there despite having a 5-1 lead in the 9th inning of the last game. The Dodgers also dropped out of first place during this time. Interleague play then begun with the Blue Jays coming to Los Angeles. The Dodgers were able to end a three-game losing streak in 10 innings, with a walk off home run but then lost the next two games from the Blue Jays. They then swept the 1st Place team of the NL East, the Mets in a three-game series at Dodger Stadium. The Freeway Series then returned, this time to Dodger Stadium where the Dodgers stole the first game from the Angles, but then lost the next two. The Dodgers then had a ten-game road trip to Toronto, Tampa Bay, and Arizona. They went 6-4 on the road trip. They returned home to play their division rivals, the Padres and lost the first two games. They ended June with an even 14-14 record. The Dodgers went 3-4 before the All Star Break, dropping two out of four games from the Atlanta Braves and two out of three games from the Florida Marlins. After the All Star Break, the Dodgers completed a sweep of the Giants in San Francisco. This year in San Francisco, they are 6-0. The Dodgers got 2 out of 3 games from the Philadelphia Phillies and took 1 out of 3 from the New York Mets. Relief pitching became a great concern for the Dodgers after the All Star Break, with some relievers pitching an entire series, or more consecutive games. During the 2007 season, the Dodgers added an infielder named Chin-lung Hu. After Hu singled in a game against the San Diego Padres, Dodgers announcer Vin Scully remarked "And Hu's on first." See Who's on First?#Real-life parallels. The Dodgers selected 40 players in this draft. Of those, four of them would eventually play Major League baseball. The Dodgers lost their own first round pick to the San Francisco Giants as a result of signing free agent pitcher Jason Schmidt but gained a first round pick as well as a supplemental first round pick because of the loss of free agent Julio Lugo. The top draft pick was right handed pitcher Chris Withrow from Midland High School in Midland, Texas. He made his Major League debut in 2013 with the Dodgers. 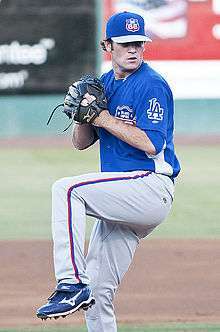 He pitched in 46 games for them over parts of two seasons, with a 2.73 ERA before he was traded to the Atlanta Braves. The supplemental pick was right handed pitcher James Adkins from the University of Tennessee. He was a 1st team Freshman All-American at Tennessee in 2006 and was MVP of the Knoxville Regional at the College World Series. Adkins is Tennessee's all-time leader in strikeouts with 350 career strikeouts. He played for the Great Lakes Loons of the Midwest League in 2007, starting 11 games for the Loons and finishing with an 0-1 record and a 2.42 ERA in 26 innings of work during his first season of professional baseball. In 2008, he was 5-8 with a 5.34 ERA for Single-A Inland Empire 66ers of San Bernardino and 1-3 with a 4.74 ERA in 8 starts for the Double-A Jacksonville Suns. He started 26 games for the Chattanooga Lookouts in 2009, with a 6-10 record and 4.48 ERA. He was converted exclusively to a reliever in 2010, making 40 appearances for the Lookouts and 5 for the Triple-A Albuquerque Isotopes. He was released by the Dodgers on April 5, 2011. He signed with the Cincinnati Reds on May 4, but was released in August. After taking the 2012 season off, Adkins spent 2013 with the Grand Prairie AirHogs and Gary SouthShore RailCats, both part of the American Association of Independent Professional Baseball. ↑ Eddy, Matt. "Minor League Transactions: Aug. 10-16". Baseball America. Retrieved 20 August 2011.